When watching a seasoned pro use their favorite application to get stuff done, you'll notice something within the first minute: They know their keyboard shortcuts cold. Where most of us reach for the mouse or rummage through the menus, the pro user knows all of their favorite key combos by heart, and doesn't hesitate to use them. Knowing your hotkeys saves time and frees you to think about what you're trying to do, rather than how to get it done. And the best part? With ShortcutFoo, mastering keyboard shortcuts doesn't have to take years. A Web-based service, ShortcutFoo offers hotkey courses on a number of popular applications, ranging from programmer's text editor Vim to Gmail, Excel, and Photoshop. Each course is called a Dojo; you can purchase access to a single Dojo for a one-time fee of $5, three for $12, or all for $20. Each Dojo is broken into multiple lessons, and each lesson has three parts: Learn, Fight, and Test. In the Learn part, you acquire new keyboard shortcuts, and get a bit of practice reviewing shortcuts you already know. Learning a new shortcut for the first time is easy: ShortcutFoo tells you what key to hit, and what it's for. For instance, "delete 5 lines" is "5dd" in Vim. Then, you just type out the hotkey and move on to the next one. Learn mode is the easiest bit of each lesson, but don't get too comfortable, because it doesn't last long. Next time, though, ShortcutFoo won't help you with a hint: It'll just ask you for the key to "delete 5 lines" (or whatever), and you'll need to remember what it was. Once you get all the keys for the current lesson right, you're done with Learn mode—and you won't be able to use it again that same day. It's time to up your game, and move on to ShortcutFoo's most vexing bit: the new Fight mode. 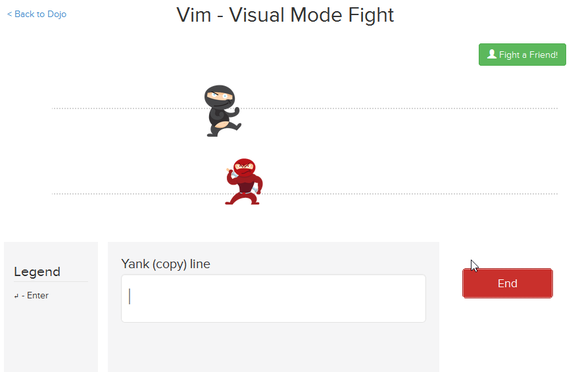 Fight mode pits you against an imaginary rival in a battle of hotkeys. It's all about speed: You get a flood of directions, such as "Switch to edit mode," "Save file," "Replace current character," and must hit the correct hotkey for each as quickly as you can. When you get it right, your ninja advances across the screen. Get it wrong, and your ninja takes a step back. All the while, your rival gradually moves across the screen (while taking an occasional step back, just to keep things interesting). If your mortal enemy gets to the end of the screen first, you lose. Fight mode is an acquired taste, but the frustration pays off: You end up really knowing your hotkeys. Fight mode isn't easy, and it often takes multiple attempts to win. But once you've acquired a hotkey through the heat of battle, you won't forget it so quickly. Future lessons will have you review that key again in Learn mode, as well as use it in fights—so it'll become ingrained and utterly familiar to you in time. Finally comes the Test part of each lesson: Here, the time pressure is off, only to be replaced by a different kind of stress. You get a prompt for each hotkey you've learned so far, not just in the current lesson, but throughout the course. Take as long as you want to think about it, because you only get a single chance to get it right. Once the test is over, you'll see how well you did. If you got more than 70% of the hotkeys right, you can move on to the next lesson. In my experience, if you take the Fight stage seriously enough and practice until you win, you'll get far better scores. After doing that, I routinely scored in the 95%-100% range, even for dozens of hotkeys. If you take Fight mode seriously, the tests are a breeze. One area where ShortcutFoo could do better is customization. You can create your own Dojo from scratch, and you can also flag hotkeys in your current Dojo to suspend them if they're not useful to you. But there's no way to add hotkeys to an existing Dojo, and you can't edit the hotkey descriptions for the pre-made Dojos. Compared to the version I reviewed in 2012, today's ShortcutFoo is a richer experience that supports more applications. The biggest change, though, is the addition of Fight mode. At the end of the day, ShortcutFoo works. I've been using it for several weeks to improve my Vim skills, and the effect has been noticeable. Thanks to Fight mode, I know my hotkeys so well, I don't have to think about them before I use them—so I use them far more than before. It's the difference between reading about a hotkey in a book or manual, and actually using it dozens or hundreds of times in a controlled environment until you have it down cold. If you've ever wanted to improve your hotkey proficiency, ShortcutFoo is one great way to do it. ShortcutFoo is an awesome way to master keyboard shortcuts and difficult commands.